Literacy Practices and Perceptions of Agency: Composing Identities. Routledge Press. 2017. 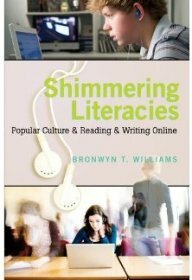 Shimmering Literacies: Popular Culture and Reading and Writing Online. New Literacies and Digital Epistemologies Series. Peter Lang. 2009. Popular Culture and Representations of Literacy. With Amy A.Zenger. Routledge Press. 2007. Identity Papers: Literacy and Power in Higher Education. Editor of Collection. Utah State University Press. 2006. Tuned In: Television and the Teaching of Writing. Portsmouth, NH: Heinemann. Boynton/Cook. 2002. Concept to Completion: Writing Well in the Social Sciences. with Mary Brydon-Miller. Dallas: Harcourt Brace. 1997. “From Screen to Screen: Students’ Use of Popular Culture Genres in Multimodal Writing Assignments” Computers and Composition. 34. 2014. 110-121. “Dancing with Don: Or Waltzing with ‘Expressivism’” Enculturation. http://www.enculturation.net/dancing-with-Don. Fall 2011. “Seeking New Worlds: The Study of Writing Beyond our Classrooms” College Composition and Communication. 62.1 September 2010. 127-146. “Multilingual Literacy Strategies in Online Worlds” Response Essay. JAC 29.1&2. 2009. 255-259. “`Which South Park Character Are You?’ Popular Culture, Literacy, and Online Performances of Identity” Computers And Composition. 25.1. 2008 24-39. “Who Reads and Writes in Hollywood? : Reading Representations of Literacy in Contemporary Movies” With Amy Zenger. International Journal of Learning. Vol 11. 2004. “Television, Authorship and Student Writers” Academic Exchange Quarterly. Special Issue on Media Literacy. 8.1 Spring 2004. 129-133. “Speak for Yourself? :Power and Hybridity in the Cross-Cultural Classroom” College Composition and Communication. 54.4 June 2003. 586-609. “What They See is What We Get: Television and Middle School Writers” Journal of Adolescent & Adult Literacy. 46.7 April 2003. 546-554. “Never Let the Truth Stand in the Way of a Good Story: A Work for Three Voices” College English 65.3 January 2003. 290-304. “The Pleasures Brought to Class: Literacy, Popular Culture, and the Middle School Classroom.” International Journal of Learning. Vol. 10. 2003. 965-976. “Reflections on a Shimmering Screen: Television’s Relationship to Writing Pedagogies” The Writing Instructor. 2.0 December 2001. “’A State of Perpetual Wandering’ Diaspora and Black British Writers.” Jouvert: A Journal of Postcolonial Studies. 3.3. Summer 1999. “Genre Inside/Genre Outside: How Students Approach Composing Multimodal Texts.” In Multimodality in Higher Education. Arlene Archer and Esther Breuer, Eds. Brill Publishers. 2016. 114-135. “Digital Technologies and Creative Writing Pedagogies.” In Creative Writing Pedagogies for the Twenty-First Century. Alexandria Peary and Tom Hunley, Eds. Southern Illinois University Press. 2015. 243-268. “Writing Creative Nonfiction” in The Blackwell Companion to Creative Writing. Graeme Harper, Ed. Wiley Blackwell. 2013. 24-39. “The World on Your Screen: New Media, Remix, and the Politics of Cross-Cultural Contact.” In New Media Literacies and Participatory Popular Culture Across Borders. Edited Collection. With Amy A. Zenger. Routledge Press. 2012. 17-32. “Introduction: Popular Culture and Literacy in a Networked World.” In New Media Literacies and Participatory Popular Culture Across Borders. Edited Collection. With Amy A. Zenger. Routledge Press. 2012. 1-14. “Ethics and Representation.” with Mary Brydon-Miller. for Sage Handbook of Digital Dissertations and Theses, Richard Andrews, et al. Eds. 2012. 181-197. “‘I’m not Always Laughing at the Jokes’: Humor as a Force for Disruption” With Julie Faulkner. In Disrupting Pedagogies and Teaching the Knowledge Society: Countering Conservative Norms with Creative Approaches. Julie Faulkner, Ed. IGI Global. 2011. “Riding Critical and Cultural Boundaries: A Multiliteracies Approach to Television Sitcoms” with Julie Faulkner. In Multiliteracies and Technology Enhanced Education: Social Practice and the Global Classroom. Darren Pullen and David Cole, Eds. Hershey, PA: IGI Global. 2009. 71-82. “Inspired Artists and Office Drones: Taking Literacy Narratives to the Movies” In Teaching in the Pop Culture Zone: Using Popular Culture in the Writing Classroom. Allison Smith, Trixie Smith, and Rebecca Bobbitt, Eds. Wadsworth. 2008. 81-90. “Foreword” Multimodal Composition: Resources for Teachers. Cynthia Selfe, Ed. Hampton Press 2007. “Introduction: Literacy, Power and the Shaping of Identity. In Identity Papers: Literacy and Power in Higher Education. Bronwyn T. Williams, Ed. Utah State University Press. 2006. 1-13. “The Book and the Truth: Faith, Rhetoric, and Teaching Across Cultures.” Negotiating Roles of Faith in Teaching Writing. Elizabeth VanderLei and Bonnie Kyburz, Ed. Portsmouth, NH: Boynton/Cook. 2005. 105-120. “Changing Directions: Participatory Research, Agency, and Representation” with Mary Brydon-Miller. Ethnography Unbound: From Theory Shock to Critical Praxis. Sidney Dobrin and Stephen Brown, Eds. Albany, NY: State U of New York Press. 2004. 241-257. “Where Should We Want to Go Today? Some Cultural Implications of Computers and Composition.” TnT: Texts and Technology. Janice R. Walker and Ollie O. Oviedo, Eds. Hampton Press. 2003. 241-270. “Find Something You Know You Can Believe In”: The Effect of Dissertation Retreats on Graduate Students’ Identities as Writers.” with Ashly Bender Smith, Tika Lamsal, and Adam Robinson. In Re/Writing the Center: Pedagogies, Practices, Partnerships to Support Graduate Students in the Writing Center. Susan Lawrence and Terry Myers Zawacki, Utah State University Press. “‘Tomorrow Will Not Be Like Today’ Literacy and Identity in a World of Multiliteracies.” Literacy and Identity Column. Journal of Adolescent & Adult Literacy. 51.8 2008 682-686. “Around the Block, Around the World: Teaching Literacy Across Cultures” Literacy and Identity Column. Journal of Adolescent & Adult Literacy. 51.6 2008. 510-514. “Trust, Betrayal, and Authorship: Plagiarism and How We Perceive Students” Literacy and Identity Column. Journal of Adolescent & Adult Literacy. 51.4 2007 350-354. “Why Johnny Can Never, Ever Read: The Perpetual Literacy Crisis and Student Identity.” Literacy and Identity Column. Journal of Adolescent and Adult Literacy. 51.2 2007. 148-153. “Action Heroes and Literate Sidekicks: Literacy and Identity in Popular Culture.” Literacy and Identity Column. Journal of Adolescent and Adult Literacy. 50.8 2007. 680-685. “I’m Ready for My Close Up Now: Electronic Portfolios and How We Read Identity” Literacy and Identity Column. Journal of Adolescent and Adult Literacy. 50.6 2007. 500-505. “Girl Power in a Digital World: Considering the Complexity of Gender, Literacy, and Technology” Literacy and Identity Column. Journal of Adolescent and Adult Literacy. 50.4 2006. 300-309. “Metamorphosis Hurts: Resistant Students and Myths of Transformation.” Literacy and Identity Column. Journal of Adolescent and Adult Literacy. 50.2 2006. 148-153. “Pay Attention To The Man Behind the Curtain: The Importance of Identity in Academic Writing.” Literacy and Identity Column. Journal of Adolescent and Adult Literacy. 49.8 2006. 710–715. “Standardized Students: The Problems With Writing for Tests Instead of People.” Literacy and Identity Column. Journal of Adolescent & Adult Literacy. 49.2 2005.152-158. “Taken on Faith: Religion and Identity in Writing Classes.” Literacy and Identity Column. Journal of Adolescent & Adult Literacy. 48.6 (2005). 514-521. “Are We Having Fun Yet? Students, Social Class, and the Pleasures of Literacy” Literacy and Identity Column. Journal of Adolescent & Adult Literacy. 48.4 (2004). 338-345. “The Truth in the Tale: Race and “Counterstorytelling” in the Classroom” Literacy and Identity Column. Journal of Adolescent & Adult Literacy. 48.2 (2004). 164-179. “A Puzzle to the Rest of Us”: Who is a “Reader” Anyway?” Literacy and Identity Column. Journal of Adolescent & Adult Literacy. 47.8 (2004). 686-689. “Boys Will Be Boys: But Do They Have to Write That Way?” Literacy and Identity Column. Journal of Adolescent & Adult Literacy. 47.6 (2004). 510-515. “Heroes, Rebels, and Victims: Student Identities in Literacy Narratives” Literacy and Identity Column. Journal of Adolescent & Adult Literacy. 47.4 2003. 342-345. “The Face in the Mirror, The Person on the Page.” Literacy and Identity Column. Journal of Adolescent & Adult Literacy. 47.2 2003. 178-183.
Review of A Geopolitics of Academic Writing by A. Suresh Canagarajah. Composition Forum. (2003) 14.1. 54-58. “Composing Identities: How Experiences of Writing Shape Perceptions of Agency.” Rochester Institute of Technology. Nov. 1, 2016. “Memory, Narrative, and the Construction of Literate Identities.” Lancaster University, United Kingdom. May 19, 2015. “Strategies for Organizing, Writing and Surviving – a Large-Scale Project.” Lancaster University, United Kingdom. May 18, 2015. “Research Ethics in the Digital University: Challenges and Opportunities” Society for Research in Higher Education. University College London, United Kingdom. April 17, 2015. “Relationships, Technology, and Patterns of Agency: How Emotion and Institutional Identities Influence Literacy Practices.” University of Bristol. United Kingdom. February 24, 2015. “Outside the Digital University: Popular Culture and Students’ Online Literacy Practices.” Society for Research in Higher Education. University of London, United Kingdom. May 10, 2013. “Finding a Way In: Literacy, Popular Culture, and Points of Participation.” Sheffield Hallam University. United Kingdom. April 18, 2013. “Metamorphosis Hurts: The Tensions of Literacy, Identity, and Agency.” University of Sheffield, United Kingdom. March 14, 2013. “Control and the Classroom in the Digital University: the Effects of Course Management Systems on Pedagogy.” Open University, United Kingdom. March 7, 2013. “Literacy, Digital Media, and Student Agency,” Texas A&M University, Commerce, TX. October 30, 2012. “What Students’ Bring to Class: Popular Culture and Composition Pedagogy.” Kansas State University. Manhattan, KS. Feb. 26, 2012. “Popular Culture and the First-Year Writing Classroom.” John Carroll University, Cleveland, OH.November 9, 2011. “The World on Your Screen: Literacy and Popular Culture in a Networked World.” Keynote Address. The Centre for the Study of New Literacies International Conference, University of Sheffield. United Kingdom. July 8-9, 2011. “Genre, Reading, and Scholarly Writing.” University of Cincinnati. Cincinnati, OH. May 1, 2011. “Reading, Response, Reflection: Approaches for Connecting Reading and Writing.” American University of Beirut. Beirut, Lebanon. March 2010. “Literacy in Everyday Life, Literacy on the Screen: Writing, Popular Culture, and Identity” Invited Presentation, Virginia Peck Composition Series, Middle Tennesee State University. Murfreesboro, TN. February 2007. “‘It Felt Like a Movie’: Representations of Literacy and Student Constructions of Literate Identities.” The Centre for the Study of Literacies International Conference, University of Sheffield. United Kingdom. July 5, 2017. “Writing centers, Enclaves, and Creating Spaces of Pedagogical and Political Change within Universities.” European Association for the Teaching of Academic Writing. London. June 21, 2017. “The Role of Emotion and Sociality in Literacy Practices with Mobile Technologies.” 8th International Conference on Multimodality. December 8, 2016. University of Cape Town, South Africa. “Teacher Response, Emotion, and the Shaping of Student Perceptions of Agency.” Writing Research Across Borders. February 15, 2017. Bogota, Colombia. “Hospitality and Collaboration: Framing Writing Response to Facilitate Student Agency.” Writing Development in Higher Education Conference. Plymouth University, United Kingdom. June 29, 2016. “Memory, Literate Identities, and Perceptions of Agency.” The Centre for the Study of Literacies International Conference, University of Sheffield. United Kingdom. July 2, 2016. “Knowing Where They’ve Been: Engaging Students’ Attitudes and Dispositions Toward Academic Writing.” European Association for the Teaching of Academic Writing. Tallinn, Estonia. June 15, 2015. “Making the Text Feel Real: Polymedia, Emotion, and Literacy Practices with Mobile Technologies.” Conference on College Composition and Communication. Tampa, FL March 19, 2015. “Patterns of Agency: How Materials, Institutions, and Emotions Shape what We Think We Can Read and Write.” Thomas R. Watson Conference on Rhetoric and Composition. University of Louisville. Louisville, KY. October 17, 2014. “Writing Centers as Enclaves: Creating Spaces of Pedagogical and Political Change within Universities.” Council of Writing Program Adminstrators Conference. Bloomington, IL. July 18, 2014. “A Writer’s Sense of Control: Response, Emotion, and Student Perceptions of Agency” Writing Development in Higher Education Conference. Coventry University, United Kingdom. July 10, 2014. “Writing Centers, Enclaves, and Creating Spaces of Pedagogical and Political Change within Universities.” The Centre for the Study of Literacies International Conference, University of Sheffield. United Kingdom. June 28, 2014. “Finding a Way In: Perceptions of Agency Among Adolescent Writers” Writing Research Across Borders Conference. Paris, France. February 21, 2014. “The Desire to Participate: Identity, Popular Culture, and Student Literacy Practices.” United Kingdom Literacy Association. Liverpool Hope University. July, 5, 2013. “Game to Engage: Stories about iPads, College students, and Social engineering.” With Jaime Caine and Julia Davies. Centre for the Study of Literacies International Conference. University of Sheffield. Sheffield, United Kingdom. June 28-29, 2013. “The Ideology of Blackboard: Rethinking Digital Media and Writing Pedagogy.” Featured Presentation. Thomas R. Watson Conference on Rhetoric and Composition. University of Louisville. Louisville, KY. October 19, 2012. “Genre Inside/Genre Outside: How Students Approach Composing Multimodal Texts.” The Centre for the Study of Literacies International Conference, University of Sheffield. United Kingdom. June 30, 2012. “From Screen to Screen: Students’ Use of Popular Culture Genres in Multimodal Writing Assignments.” Conference on College Composition and Communication. St. Louis, MO. March 2012. “Rethinking Reading and Writing with Participatory Popular Culture” International Reading Association Conference. Orlando, FL. May 2011. “The World on Your Screen: New Media, Popular Culture, and Questions of Contact.” Conference on College Composition and Communication. Atlanta, GA. April 2011. “Writing with Popular Culture: The Daily Online Literacy Practices of Students.” Writing Research Across Borders II Conference. George Mason University. February 2011. “The World Through Screens: Participatory Popular Culture and Literacy Practices Across Borders.” Thomas R.Watson Conference in Rhetoric and Composition. University of Louisville. Louisville, KY. October 2011. “Collages of Identity: Popular Culture and Online Literacies” American Educational Research Association Conference, Denver, CO May 2010. “Reading for Plunder: How Online Popular Culture is Transforming Student Reading and Writing Practices.” Conference on College Composition and Communication, Louisville, KY March 2010. Fulbright Research Fellowship. University of Sheffield, January-July 2013. Project Completion Grant, University of Louisville 2006-2007. “A Multidisciplinary Literacy Approach to Closing the Achievement Gap for Urban Middle School Students.” (Co-Authors, Ann Larson, Linda Irwin-Devitas, Ellen McIntyre, and Brenda Overturf). Kentucky Council on Postsecondary Education. 2003-2004. National Endowment for the Humanities Summer Stipend. “Literacy, Popular Culture, and the Middle School Classroom.” 2002. Project Completion Grant, University of Louisville 2001-2002. Teaching Assistant, English Department, University of New Hampshire. (’88-’89 and ’96-’99). Instructor, English Department, University of New Hampshire. (’90-’94). Ludewig, Ashley. 2017. The Military Meets the University: Mapping Issues of Literacy Sponsorship Across Military and Academic Settings. Hancock, Meghan. 2017. New Genres and New Challenges: Five Interdisciplinary Case Studies of Master’s Student Writers. Winck, Jessica. 2016. Amused Teachers and Public Readers: Empathy and Derision in ‘Student Blooper’ Collections. Weaver, Stephanie. 2016. The Available Means of Imagination. Perry, Kathryn. 2016. Stories of Single Mothers: Narrating the Sociomaterial Mechanisms of Community Literacy. Kelley, Brittany. 2015. To My Betas, Endless Chocolate Frogs! : Exploring the Intersections of Emotion, the Body, and Literacy in Online Fanfiction. Bender Smith, Ashly. 2015. A Few Good Men and Women: The Rhetorical Constitution of Military Personnel Identity. Wright, Hollye. 2015. Hidden Sites of ‘First-Year’ Composition: What Do We Mean When We say ‘AP’? The Diversity of Practices in AP Englilsh Language and Composition. Wiles, Matthew. 2014. Prompting Discussion: Writing Prompts, Habits of Mind, and the Shape of the Writing Classroom. Nordquist, Brice. 2014. Composing College and Career: Mobility, Complexity and Agency at the Nexus of High School, College and Work. Howard, Shannon: 2014 “My Watch Begins”: Identification and Procedural Rhetoric on Second Screens and Social Networks. Wilkinson, Caroline. 2014. Competing Conceptions of Literacy: Intersections in a Dual Credit Writing Program. Detmering, Laura. 2013. Literacy and Identity in Popular and Participatory Culture. Leake, Eric. 2011. In Another’s Words: On the Promises and Paradoxes of Rhetorics of Empathy. Romesburg, James. 2011. Retrograde Movements and the Educational Encounter: Working-Class Adults in First-Year Composition. Coaplen-Anderson, Carrie. 2009. How Katrina Survivors Write Home: Writing, Identity, and Place. Keller, Dan 2007. Literacies in Transition: The Reading Practices of Entering College Students. Nichols, Dana. 2006. Democratizing Diversity: Race, Rhetoric, and Conflict in the University. Carpenter, Richard. 2005. You and I/Me and Not-Me: Romantic Love and the Relational Self (A Literacy Study). Crane, Mark. 2005. Social Literacies in the Networked Classroom. Ph.D. General Exam Committee 2003-present (Chair, 2004-2007; 2010-2012; 2015-present). Writing Pedagogy Consultant, Jefferson County Public Schools, 2002-present. Game 2 Engage Project. Sheffield College, United Kingdom. 2013. After-school Literacy Program, Rawmarsh Community School. Rawmarsh, United Kingdom. 2013.
Review Board Member for Senior Projects, The Brown School, Jefferson County Public Schools, 2009- 2012. Judge – Norman Mailer Creative Nonfiction Award – NCTE. 2010.